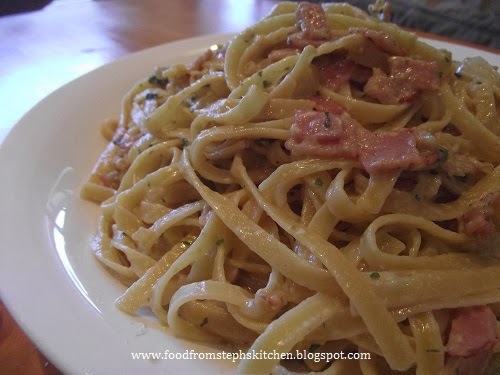 Over the years I have slowly created this carbonara recipe. The best part is it's a sticky carbonara sauce - not a pasta sitting in a bowl of cream like some carbonara recipes are. It's quick and easy, and it's just the best throw-together meal when I don't know what else to make. The sauce in this recipe is to coat the pasta, and not have it sitting in sauce like some other recipes. If you would like more sauce, double the below recipe. 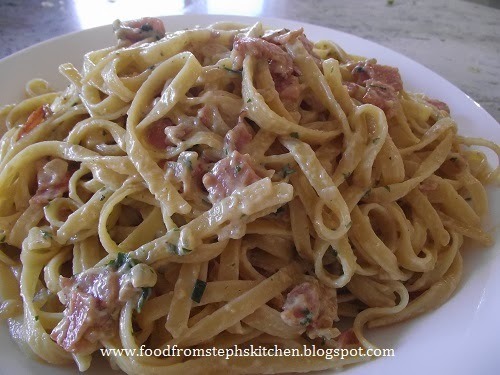 For chicken and bacon carbonara add 1 small chicken breast or two thighs, cut into strips. The first thing I do is get my pasta done – because this sauce doesn't take long! So put on your pot of water and bring it to the boil. Once boiling add in a little bit of salt, followed by your packet of pasta. Now that the pasta is cooking, you can get started on your sauce. In a small jug whisk up your egg yolk and cream, then add in your selection of herbs and a little bit of pepper. Saute your onions in a little bit of oil (about 1 Tbsp) with your bacon and chicken. Once the chicken is cooked turn down your pan to a simmer. Wait a couple of minutes for the pan to cool down to the lower temperature before adding in your cream mixture and stirring it through your bacon and chicken. Allow your sauce to simmer, stirring occasionally, until your sauce thickens and turns a yellowy cream colour. Finally add the cheese to your sauce, followed by your drained pasta. Fold the pasta through your sauce and serve, sprinkling parmesan cheese over the top. This looks like a fabulously simple sauce! Thanks for sharing at Simple Supper Tuesday. I used turkey bacon. It smelled and tasted delicious!